I’ve never cooked with wild rice before, although it has been in my pantry staring back at me for quite some time. I live by myself therefore I’ve had ALOT of practice for cooking for one. This recipe however I made to serve two and took the leftovers to work the next day – Lets just say knowing I had this to enjoy for dinner definitely made my shift go faster! It’s super easy, full of flavour and the serving size can be easily multiplied to serve a family.Feel free to try it out and let me know your thoughts! In a saucepan boil rice with double the amount of water and vegetable stock. Once rice is cooked add oil, carrot, celery, red onion, soy sauce, mushrooms, garlic, salt and pepper. Stir to slightly cook vegetables. Crumble feta and add to the mix. Cup the top of the capsicum off and scoop out all the seeds from the centre. Paint lightly with oil. Fill each capsicum with the rice mixture. Grate parmesan cheese over the top of the stuffed capsicums. 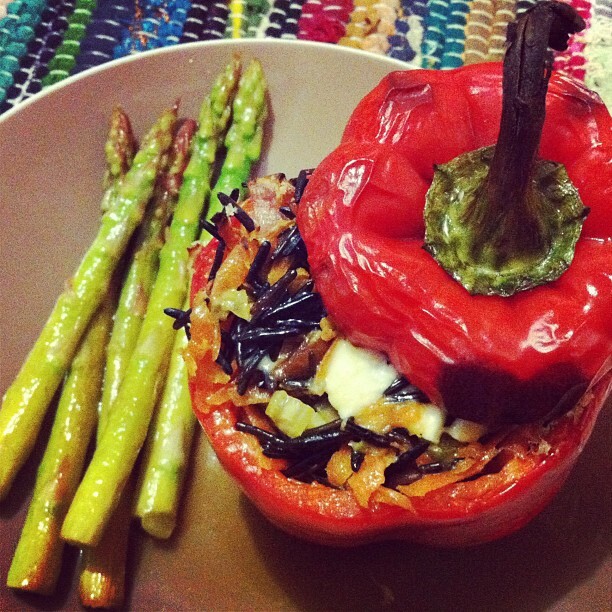 Put the “lid” of the capsicum on and bake in a 180 degree oven for appox 25-30 mins or until capsicum is cooked.